GIS is used to manage data, such as ground moisture content, the presence of harmful insects and mildew, and the status of specially cultivated rows. ArcGIS aids harvest analysis, the selection of prospective planting sites, in-field data collection, and determining irrigation requirements. Broad access to the GIS platform ensures that everyone in the organization is on the same page. Scheid Vineyards (originally known as the Monterey Farming Corporation) was founded in 1972 in Monterey County, California. The business has progressively grown, and today it farms approximately 4,200 acres of varietal wine grapes, making it one of the leading independent producers in the United States. Land suitable for planting a vineyard to be machine harvested needs a slope of less than 14 degrees for the harvester, good sun exposure in September to ripen the fruit, and to be southern facing. This map shows all three factors and identifies the best places to plant. The map was made using a digital elevation model and ArcGIS for Desktop. Monterey County is known for having the longest growing season in the state due to the maritime influence of Monterey Bay and the unique geography of the Salinas Valley. This longer "hang time" (the time the fruit spends on the vine) allows the grapes to ripen slowly and evenly and achieve peak flavor development. Scheid Vineyards, with 10 estate vineyards located along a 70-mile spread, is able to grow 29 different varieties in a spectrum of styles. The first implementation of GIS on the vineyard started in 1998, when Tyler Scheid surveyed all the vineyard properties in submeter GPS, including a detailed irrigation system and frost zone mapping at the Hames Valley vineyard. 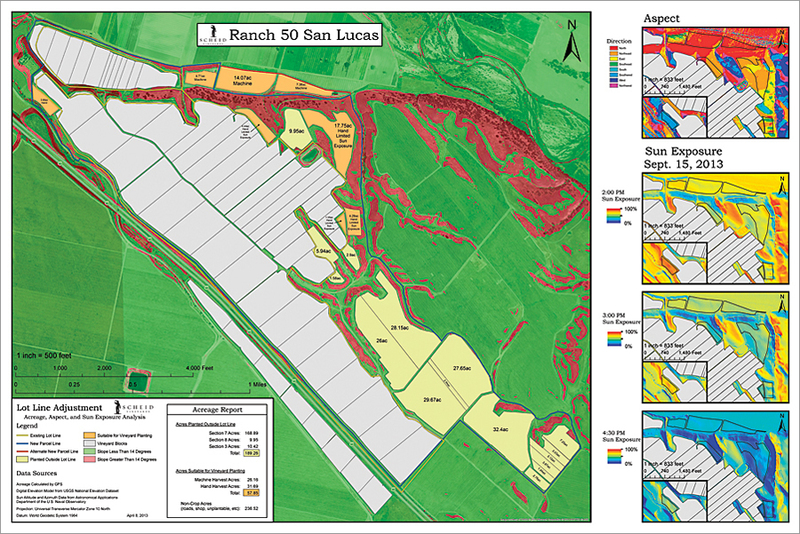 ArcView then allowed him to do some basic analysis, such as generating soil series acreages relative to vineyard blocks and verifying vine count for each block compared to geographic acreages. Gregory Gonzalez joined the company in 2009 as an intern after graduating from nearby California State University, Monterey Bay, with a degree in GIS, and has since brought the GIS program at Scheid to new levels of sophistication. Today, Gonzalez is a ranch supervisor and GIS technologist at the vineyard. Other GIS/vineyard technology team members include Jonathan Vevoda, a GIS specialist, and Scheid, technology coordinator. Together they have implemented an enterprise-wide precision farming system with the ArcGIS platform at its core. The GIS is used for data management, harvest analysis, selection of prospective planting sites, in-field data collection, and determining irrigation requirements and as a company-wide information portal. "A GIS is the backbone of any precision farming operation," says Vevoda. "It is the spatial data reservoir from which you can draw in order to make informed decisions in a timely and efficient manner. Using a GIS as the information hub in an agricultural operation ensures that everyone within the company is looking at the same data and the entire operation is aware of what is going on in the individual departments and can react accordingly." The Harvest Safety Rating System matches the experience level of Scheid workers with individual vineyard blocks as beginner, intermediate, and advanced. This greatly decreased Scheid's accident rate and increased production efficiency. For personnel and production management, the vineyard has partnered with AgCode of Glenwood, Minnesota, a production/payroll company that helps track costs and production to ranch, section, and block levels. It also has the ability to track these variables by crew or individual. 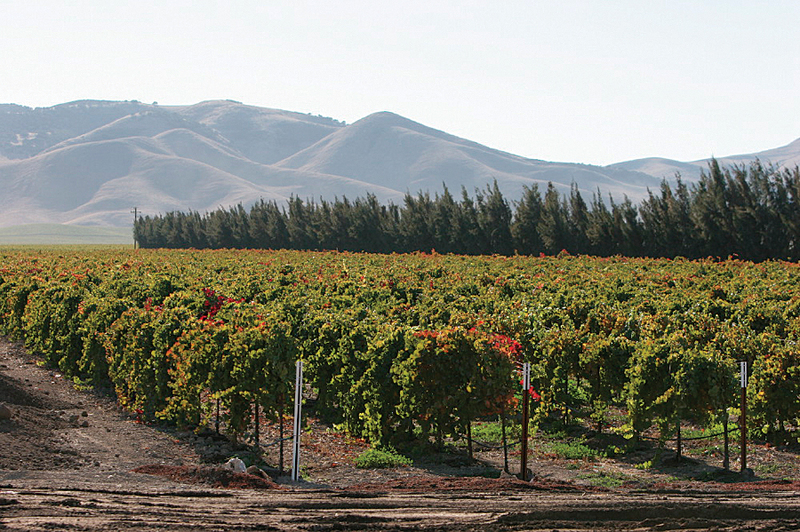 By using AgCode, the vineyard was able to eliminate paper-based production records and capture field-level production data directly into the database, which then feeds ArcGIS. This gives it the capability to catch inefficiencies in near real time and then investigate and make adjustments when needed. The vineyard also uses the Web Soil Survey, a US soils database produced by the National Cooperative Soil Survey and maintained by the US Department of Agriculture Natural Resources Conservation Service. This service provides information on soil types and crop suitability for specified areas. The site is regularly updated and is the single authoritative source of soil survey information in the United States. 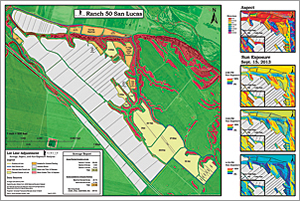 Scheid Vineyards uses the soils map layers for site evaluation for prospective plantings. It helps determine the most suitable vine rootstock and clone combinations in the areas selected for cultivation. Neutron probes have been installed throughout Scheid Vineyards to monitor the amount of moisture in the ground in a specified area. The information collected from each probe is added to the GIS so that all the data can be interpolated to create a raster map that represents soil moisture levels across the entire operation. This soil moisture map then becomes another layer in the vineyard's enterprise GIS. 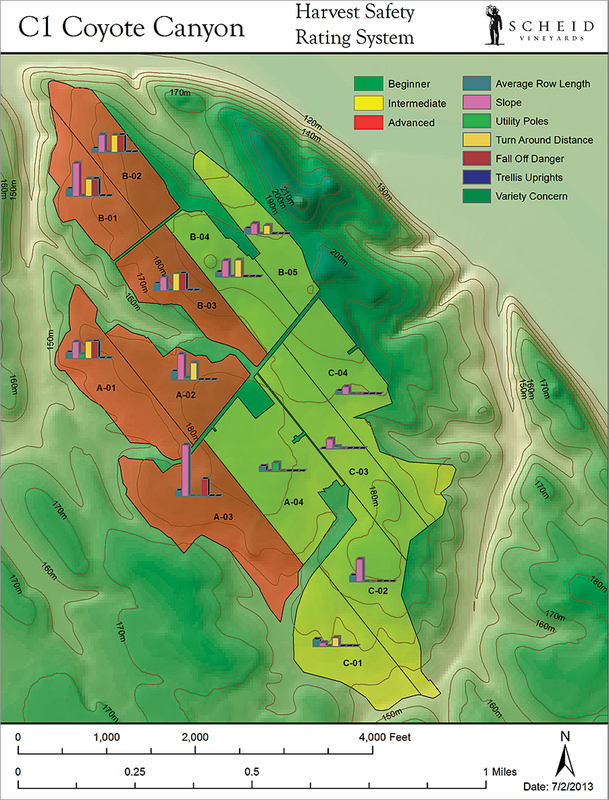 The map will be used as part of the vineyard's irrigation geographic infrastructure, which is currently under development. The GIS/vineyard technology team is planning to integrate weather station and irrigation data with the soil moisture map and remote-sensing data so that it can become more dynamic and precise in the application and monitoring of its irrigation processes. The team is currently testing various pest scouting data collection methods for use with its ArcGIS for Mobile platform. Throughout the growing season, the vineyard is constantly monitoring the vines for the presence of harmful insects, diseases, and mildew. Recording pest sightings and their locations in the field and then directly transmitting that information to the GIS for analysis allows ranch managers to take immediate action to combat a disease or insect invasion and minimize the damage to the vines. GIS is also used to track the special treatment of some vines for Scheid's Estate Row program. This program involves the careful monitoring of specific rows of vines within the vineyard that are cultivated differently than the others, depending on the winemaker's needs. The treatment of these rows varies from year to year, and the winemakers carefully evaluate the quality of the wine produced after each harvest. The goal is to replicate an especially good wine by following the same procedures and treatments previously performed on a particular row. The collected data for the Estate Row program is maintained in the GIS so that it is accessible throughout the entire company for review. "By developing an operations central GIS, we can integrate essential data from a variety of sources and eliminate a large portion of the tedious, time-consuming processes that previously made a major impact on our operational efficiency," Gonzalez says. "Broad access to the GIS platform ensures that everyone in our organization is on the same page, which allows us to do more with less: less paperwork, less double data entry, less driving, less fuel, less confusion, less contradiction, and so on. In turn, we are creating more time for mission-critical tasks, such as evaluating production quality and characteristics relative to targets set in our wine programs. We can spend more time with the vines and, by doing so, increase our understanding and knowledge so that we can continue to push the envelope on the quality of our wines." With Esri's announcement of ArcGIS GeoEvent Processor for Server, the vineyard hopes to take advantage of its real-time data streaming capabilities. "This will be a good product for our asset management program as we continue to build our geoinfrastructure," says Scheid. "It will allow us to not only track equipment movement but also the critical hours of usage, which will help us evaluate service schedules and overall equipment use. We also plan to use the ArcGIS Tracking Analyst and Network Analyst extensions to ensure the maximum efficiency and profitability from our equipment fleet." For more information, contact Tyler Scheid, technology coordinator, Scheid Vineyards.